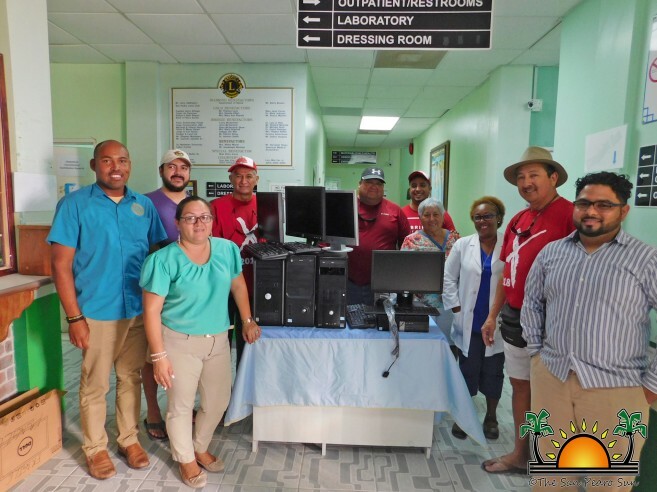 The Incumbent San Pedro Town Council (SPTC) donated five computers to the Dr. Otto Rodriguez San Pedro Polyclinic II on Wednesday, February 28th. Present at the official hand over was incumbent Mayor Daniel Guerrero, incumbent Deputy Mayor, Gary Grief and incumbent Councilors Flora Ancona, Hector “Tito” Alamilla, Ruben “Rox” Gonzalez and Gabriel “Gaby” Nunez along with clinic Administrator, Eric Najarro, and staff members of the Polyclinic. Guerrero stated that he had promised computers to the polyclinic after providing them with approximately $6,000 dollars for better medical equipment. “This was something that we had promised the polyclinic a long time ago as we heard that they didn’t have many computers and they were doing their work handwritten. I believe the polyclinic is doing a great job on the island,” said Guerrero. Dr. Otto Rodriguez San Pedro Polyclinic II, Administrator, Eric Najarro stated that he is very thankful for the kind donations from Guerrero and the SPTC. “The donations are much appreciated at the Polyclinic. As now we will be replacing the old computers we had for the new ones. I want to thank them for their kind donation and for always helping the polyclinic,” said Najarro. Guerrero further told The San Pedro Sun that the Town Council is already working on getting new incinerators for the polyclinic as well. The Dr. Otto Rodriguez San Pedro Polyclinic II thanks the SPTC for their kind donation and that the new computers will help them work more efficiently.